Cinderella was never one of my favourite princesses. Maybe because Disney’s Cinderella was released in 1950, which was way before I was born. 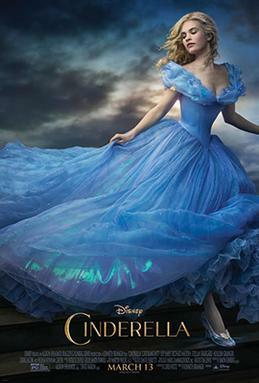 My lack of affection for the tale resulted in little desire to watch Disney’s live action Cinderella. I went mostly because my friend wanted to go and I wanted to add to my collection of live action fairytale remakes. I’ve been watching all the recent fairytale remakes like Snow White And The Huntsman (2012) and Jack The Giant Slayer (2013), so I couldn’t miss out on watching Cinderella now could I.
Disney’s latest version of Cinderella reminds me of Drew Barrymore’s Danielle in Ever After: A Cinderella Story (1998). Both are strong, kindhearted, and spirited girls. Besides the magic and the fairy godmother, I like that this Cinderella story had logical explanations to the age old tale and gave the romance time to actually bloom. We got the chance to get to know Cinderella’s Prince “Kit” Charming and I was glad that Disney continued to move away from the notion of love at first sight. While the Prince was enamored by Cinderella, he got the chance to get to know her better at the ball. This is not something new. This plot addition to the Cinderella tale was already featured in Rodgers & Hammerstein’s Cinderella (1997) and Ever After: A Cinderella Story (1998). In fact, in the latter, Drew Barrymore’s Cinderella character ‘Danielle’ and Dougray Scott’s ‘Prince Henry’ meet and interact with each other more than twice, allowing the romance and love to gradually grow. Hence making the tale more realistic and believable. Something I truly appreciate. This latest live action fairytale installment by Disney took me quite by surprise. Other than veterans Cate Blanchett, Stellan Skarsgård, Helena Bonham Carter, director Kenneth Branagh, and writer Chris Weitz, there were not many big names in this film. Plus, the two leads are relatively new to the film scene. I didn’t know who Richard Madden (Prince “Kit” Charming) was as I haven’t caught up with my Game Of Thrones episodes. And I didn’t know who Lily James (Cinderella) was as I did not follow Downton Abbey. But both these young leads did a wonderful job playing Cinderella and her Prince Charming. Especially Lily James. The film was well cast especially with regards to Cinderella’s cruel stepmother played by Cate Blanchett. Every time she sweeps into the scene, she emanates an underlying viciousness that sends shivers down your spine. And yet, you don’t blame her. Well, at least I don’t. Why? Because of one particular scene in the film where I saw her vulnerability and realised her reason for hating Cinderella and that house so much. So like Cinderella, I forgave her. And even though Helena Bonham Carter doesn’t appear much in the film, it is quite a refreshing change to see her play some with so much innocence and lightness. Her fairy godmother character adds quite a bit of comedy with just the right dash of zaniness without going overboard like a lot of the characters she’s played over the years. I also like the nod to Disney’s next live action fairytale remake Beauty And The Beast. See if you can spot it.